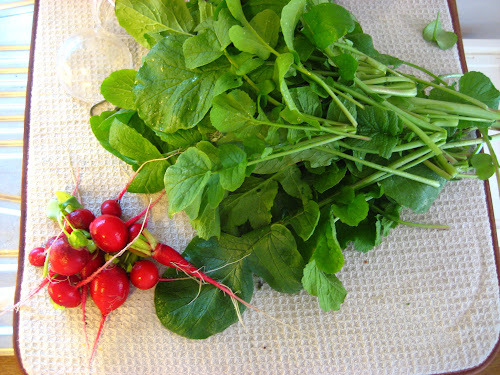 Did I mention we grew a lot of radishes this summer in our Zombie Garden? 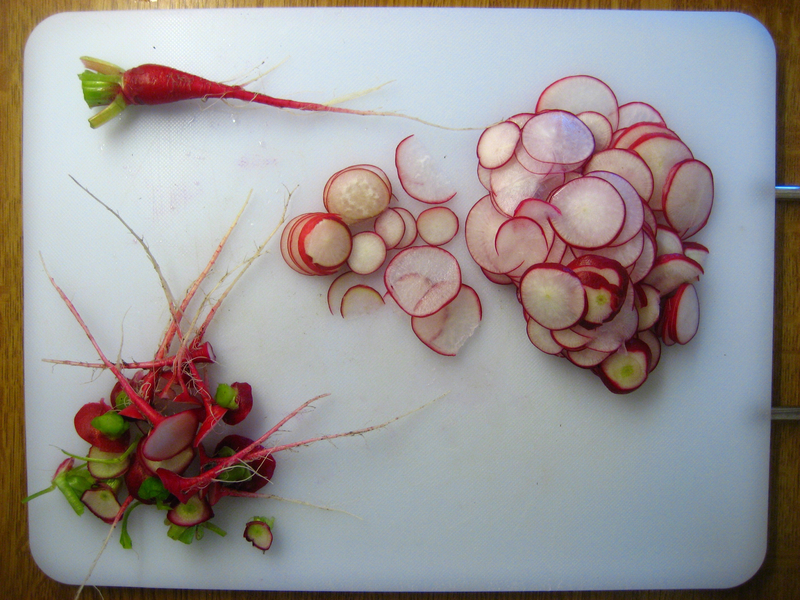 Because we grew A LOT of radishes. Vegetable Gardening for Dummies said that since radishes grow really fast, you can just scatter them on top of your garden after you plant everything else. The radishes will be ready for harvest before the rest of the veggies grow enough to crowd them. So I did just that. Scattered a bunch of seeds over all my pots. A whole handful of seeds. See where we might have gone wrong? The fact that the glazed radishes were delicious was unsurprising because, let’s be honest, the recipe calls for “a slab of butter.” The glazing process turns the radishes into juicy little pink balls of sweet-n-salty goodness that I’m now convinced will convert any radish-hater. The radish-top soup, however, was the star. The recipe came about after I made the glazed radishes. 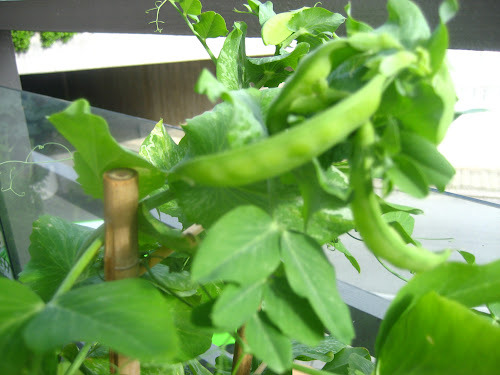 It only called for the bottom root parts which left the leafy greens, majority of the plant, to go to waste. I was distressed because I worked hard to grow those stinkin’ radishes! I didn’t want to throw them out after all that watering and weeding! Plus, since this is an apocalypse garden, I wanted to be all homesteady and use the entire plant. Most recipes I found online said to toss the tops in salads, but when I tried that they were spiney and made my tongue itch. In my searches though, I stumbled across the idea to make Radish-Top Soup so I gave that a shot. It was super simple to make and it tasted like split-pea soup, which Chris loves. SUCCESS! It also made a lot more meals than just the radish bottoms did. We still have some of it frozen in the freezer. Which makes it a pretty good apocalypse dinner, me thinks. Why waste the radish plant by only using the bottoms? Melt bacon fat in a medium pot. Add raish leaves and saute for 3-4 minutes until wilted. Add potatoes and continue to saute for 3-4 minutes longer. Add onions and garlic and saute for another 3 minutes. Add hot chicken broth. Bring to a boil, then reduce to a simmer for 25-30 minutes. When potatoes are soft, puree the soup with an immersion blender (or normal blender, just be careful!) until well-blended and creamy. Add salt, pepper and cajun seasoing to taste. If you cooked bacon to get the bacon fat, sprinkle soup with chopped bacon bits and a dollop of sour cream! I think despite the initial “HOLY RADISHES BATMAN! !” panic, we will definitely be planting radishes again next year! A few months ago, after finishing an episode of The Walking Dead, Chris was talking all big and manly about how if the zombie apocalypse actually happened he would totally dominate and be King of the Survivors. 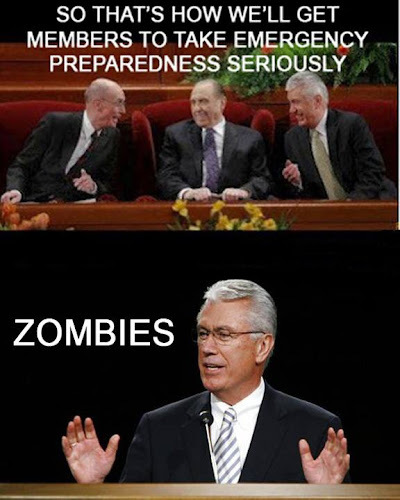 Emergency preparedness just always seemed like a boring adult thing to worry about. Apparently though, we are technically grown up. And we want to survive the zombies dang it! It suddenly seems a little less boring! So over the past year we've been trying to work on getting more prepared for emergencies. Norway seems to be both a great place and awful place to weather a zombie apocalypse. For one thing, it's cold, so that would slow down the zombies. It's also rather sparsly populated. Less zombies to fight off. On the other hand, it's really hard to grow food here (just ask the vikings. It was way easier to just pillage and plunder). So I took that as a challenge this summer and planted a Zombie Survival Garden on our balcony patio. I am definitely a dummy when it comes to green things, so I used Vegetable Gardening for Dummies as my garden sensei. I filled my brain with seed starters, harvesting times, succession crops, watering schedules and dreams of garden-fresh salads and home-grown stuffed peppers. Since the summers here don't get that warm, I tried to focus on cold-weather, spring/fall crops. We got a TON of radishes! If you are ever in an apocalypse scenario, plant radishes. They grow like nobody's business! Just be sure to stake them with stakes taller than 3 feet. They grow reeeallly long. Who knew? 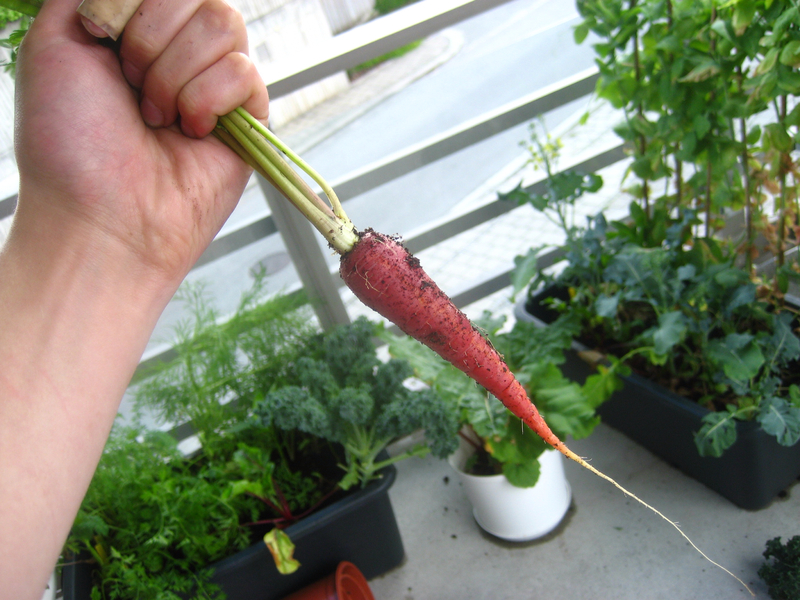 I managed to get a few carrots (I planted a rainbow variety, which was awesome!) They grew a bit short and stubby unfortunately though. I'm thinking it was because the containers weren't deep enough? It took forever to grow big enough to eat, but once it grew it was awesome! We tried making kale chips for the first time. I think I'm a fan! Unfortunately it was just too cold for my little pepper seedlings. They tried their little hardest though! They grew, but they were little bitty beets. I'm not sure what went wrong there. Since broccoli is a cold-weather crop, I figured it would be a shoe-in. 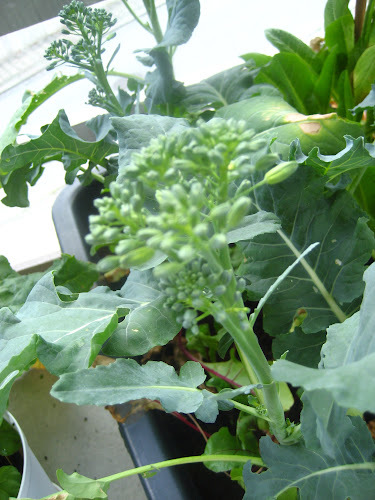 Unfortunately, each plant only produced one tiny bite of broccoli. And then those little bits bloomed into yellow flowers overnight. 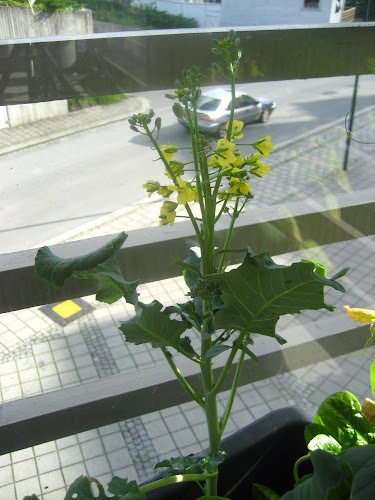 I suspect I planted the broccoli too early in the season. Pay attention to timing in the season. Some plants really do grow better in cold weather and others in warm. Vegetables need more sun than you think they do. Don't overcrowd your patio pots. The seedlings look small when you plant them, but they grow fast and you won't get big harvests if your plants are too crowded. All-in-all, we probably only grew enough produce for us to survive a week, but I'd say it was a pretty successful first attempt. I'm not saying we're ready to survive any apocalypses in the near future, but at least if it happened tomorrow, we know we could survive on radishes!